Our 20 years of experience allows us to identify key issues and develop cost-effective, highly focused solutions. For larger projects that require an in-depth understanding of the local hydrogeology, we often begin by characterizing the aquifers and groundwater flow systems that underlie a site. In some cases, groundwater modeling is required to understand the complexities of flow beneath the landfill and predict how pumping from nearby wells will affect contaminants. 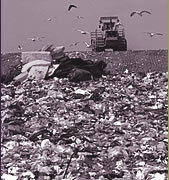 We also assist landfills with environmental reporting. We encourage you to browse a few case studies to learn how we have helped our clients meet their regulatory requirements.